Papa Bird and I are trying to expose Baby Bird to books and music every chance we get. When I was contacted about doing a review for a children’s book that included a musical CD, I couldn’t pass it up. 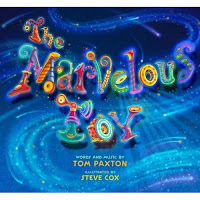 The Marvelous Toy is written by Tom Paxton and he is also the artist behind the CD. Tom Paxton is one of the world’s best loved folk musicians. The song “The Marvelous Toy” has actually been around for awhile and now we have a wonderful book to match it. The song, and now the book is about a magnificent, magical toy that the author receives as a young boy. He’s not sure exactly what it is, but he loves it and eventually passes it down to his son later in life. I love the song and the book is a perfect match for it. It is well written and a pleasure to read (even for big kids). There are a total of 4 songs on the CD that is located in a nice pocket at the back of the book, and my favorite is the title song. The other songs are really good too. I like to quickly review anything before giving it to Baby Bird, so I was listening to the CD as I was putting away Baby Bird’s clothes one night and she came crawling into the room. She listened for a moment, then smiled and started to do a little dance, so I know she is enjoying it. The art work of the book is so beautiful. It is illustrated by Steve Cox, an award-winning artist who has illustrated many children’s books such as Pigs Might Fly. The pages are filled with colour and imagination and Steve has done an excellent job of visually telling the story. Now I’m curious. What was your favourite toy as a child? My favourite was my cabbage patch doll..
My favorite toy was my big brown christmas bear I named Wally. He got so worn out over the years, he fell apart so many times that I don’t think he had any of his original seams left. I still can’t bring myself to throw him out. My favorite toy as a child were two dolls…Vern and Beth. I still have them and my son now plays with them! My Cabbage Patch doll had to be my fav. my favorite toy as a child was a fairly small teddy bear that my god mother bought me the day i was born. to this day i still hold that bear close to my heart, and my three month old son has it in his crib. I really don't remember what my favourite toy was! I do remember drawing whiskers on a doll I had just received from Santa – boy was Mom ever mad! my favourite toy when I was a child was mr. potato head. I had a favourite doll named "Billie Jeans". She had a little denim body and red hair. My favorite toy was a doll that had long red hair that you could wind up with a knob in the back of her back. My favorite toy was Lego. It was a toy you could do anything with. I had an ernie doll that i was a big fan of!! My fav toy was a barbie that had this foam for the tub that you could make dresses with. I loved my Fisher Price town. My mom still has it. My favourite toy was a stuffed pink teddy bear named, "Teddy". He had no eyes (because I'd ripped them off) but I loved him all the same. My favourite toy was a tiny lifelike baby doll that you could wind up and it played a lullaby.